The Rainbow Beach Sports and Recreational Club will host the annual Rainbow Beach Family Fishing Classic, July 20 to 28 2018. This year marks the 32nd year of the major saltwater fishing tournament, one of the few remaining successful fishing tournaments on the eastern seaboard. Last year, the tournament attracted more than 650 competitors and 2018 promises much higher numbers as thousands of tourists are expected to stay and play in Rainbow Beach. As part of the event, the Twilight Expo will run across two nights, July 21 and 22 and will showcase some of the regions best exhibitors of fishing gear, expo merchandise, bait & tackle, boating accessories and outdoor gear. The Fishing Classic has 4 major classes of fishing, ‘Beach’, ‘Reef’, ‘Jew’ and ‘Big Fish’. These classes provide offshore, inshore and beach fishing and cater for all levels of fishing experience. Major prizes are awarded based on participation rather than competitive spirit. To participate, all you need to do is fill in an online entry form or download an entry form, complete the details and send it off. Please remember, you also need to be a social member of the Club as this covers all the insurance requirements. 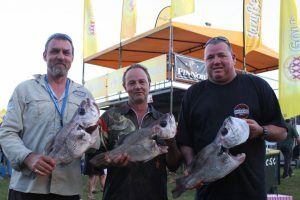 Visit: www.rainbowbeachfishingclassic.com or call the Sports Club on 5486 3191.